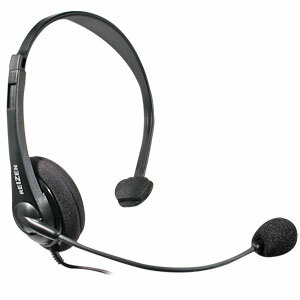 This economy headset offers all-day comfort and superior sound quality. With its lightweight over-the-head single foam earpiece design and Quick Disconnect feature, this headset will get the job done. The headset adjusts for a variety of head sizes with a comfortable foam ear cushion that makes wearing these headsets for long periods of time, a pleasure. The microphone boom is extremely flexible and bendable to any position, and can rotate so the earpiece accommodates either the left or the right ear. The noise-canceling microphone reduces surrounding background noise while giving you crystal clear phone calls. Comes complete with a coiled cord and shirt clip to keep the cord tangle-free. Use the Quick Disconnect option to walk away from the phone while still wearing the headset. Uses a standard phone RJ-11 modular plug. Covered under a 1-year mfg. warranty.